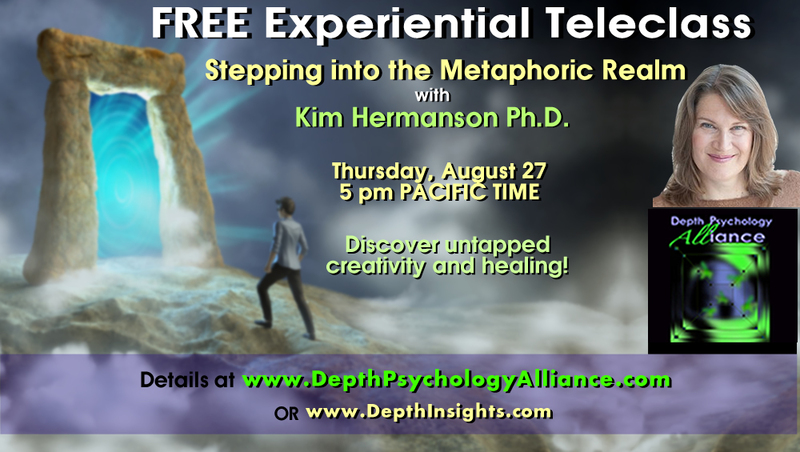 Join us for a free experiential teleclass via Depth Psychology Alliance: "Stepping into the Metaphorical Realm" with Kim Hermanson, Ph.D. Discover untapped creativity and healing!Draw on the ancient powers of metaphor as portals into a realm of profound beauty and creativity. Meet new resources, possibilities and answers that you wouldn’t receive in any other way. All of us contain a vast reservoir of untapped creativity. What shows up will surprise you! This free event is an introductory session for the upcoming quarterly series, "Stepping into the Metaphoric Realm," hosted by Depth Psychology Alliance. In this experiential telecass, we will be using the ancient powers of metaphor as a portal into a realm of profound beauty. All of us contain a vast reservoir of untapped creativity. When we receive a healing image from this dimension, something new has been brought into form. Please join us to meet new resources, possibilities and answers that you wouldn’t receive in any other way. What shows up will surprise you. This is a free event. Click here to REGISTER to expand your own capacity for consciousness and healing. Kim Hermanson, PhD serves as adjunct faculty at Pacifica Graduate Institute and is the founder of Doorway sessions for creative breakthroughs. In 2007 a life-changing visionary experience gave her the ability to see and guide others to a non-ordinary dimension of profound beauty. Kim offers deeply experiential and transformative work, and is known for her skill in quickly shifting people out of spiritual and psychological difficulties and into a space of expansive creative flow. She is the author of Getting Messy: A Guide to Taking Risks and Opening the Imagination.